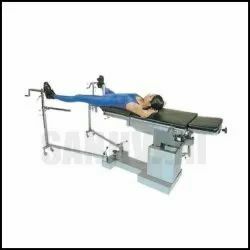 Pioneers in the industry, we offer hydraulic operation table, simple operation table, telescopic operation table, height adjustable operation table and hydraulic operation table with orthopedic attachment from India. We are one of the noteworthy enterprises engaged in offering superior quality Hydraulic Operation Table. The table comes with accessories such as a saline rod, mattress, casters (set of four) two with brake, a pair of side railings, stainless steel bows & side railings, and urine bag holder. Apart from this, clients may provide custom specifications to us and our engineers manufacture the table with perfection. Our organization takes pleasure to introduce its business as one of the leading entity offering Simple Operation Table. The table is manufactured using stainless steel top, and powder coated base. This table has removable and folding foot end with S.S drainage tray. Also, the offered table has lithotomic bars with stirrups and arm boards. Apart from this, clients can get the table from us at cost-effective rates. Bestowed with an ingenious team of experienced professionals, we have been able to introduce an exclusive range of Telescopic Operation Table. The table has three section stainless steel top, stainless steel base, and backrest on the ratchet. Furthermore, the table has hand grips on both side and a middle section having primal cut with the bowl. Besides, clients can get the table from us at industry leading rates. With the excellent support of our brilliant professionals, we are engaged in presenting Height Adjustable Operation Table. The offered table is developed in accordance with industry norms and quality parameters. In the offered table, our professionals use the approved material during the manufacturing process. In addition, this table can be built and developed according to the specification provided by the clients. Furthermore, our professionals opt for strict quality inspection made on the table to ensure high performance. 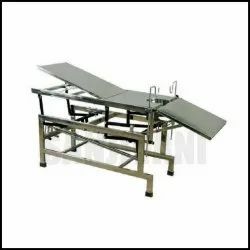 Our firm has gained continuous appreciation as the prime organization offering of Hydraulic Operation Table with Orthopedic Attachment. The attachment allows the positioning of the extremity as required in regard to the surgery practice and therefore is especially adapted to ensure safe and efficient. 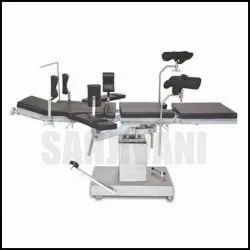 The table comes with the attachments such as orthopedic section, pelvic rest in 2 sizes, pelvis support (radio translucent), and inner thigh support (radio translucent). UNITED Orthopedic Attachment is a flexible, easily operable instrument for ORTHOPEDIC SURGERY. The attachment allows the positioning of the extremity as required in regard to the surgery practice and therefore is especially adapted to ensure safe and efficient. 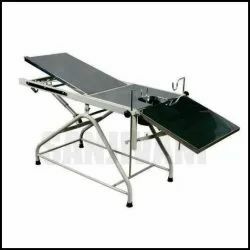 With an objective to fulfill the diverse requirement of the clients, we are also engaged in the manufacturing, exporting and supplying of Hydraulic Operating Table. This range is manufactured by a team of deft experts using high-grade material and latest technology. Further, our quality controllers test this range at various quality parameters to ensure flawless dispatch. Customers can purchase the offered range from us in varied specifications according to their requirements.